Antique Terms C – The antique marks glossary from cabaret to cutlery and cabinet to cut glass. Below you will find antique related words or antique terms beginning with the letter C.
The list is not exhaustive but we will add to it as time goes by. The descriptions detailed are only intended to be relevant to how the word or term relates to antiques. small tray usually of porcelain with a matching set of cups, milk jug, sugar bowl and tea or coffee pot. Also — breakfast cabaret for serving breakfast and known as a dejeuner. Also — a tete-a-tete for serving two and a solitaire for serving one. The term used to describe a piece of furniture incorporating drawer and cupboard space and designed for the storage of small, possibly precious, objects. Also referred to a small room in the 16thC. in which precious articles and pictures were displayed. Only applied to furniture in the 17thC. Cabinet popularity increased in the restoration period and gave rise to the skilled practice of cabinet-making with elaborately veneered surfaces. Cabinet making is normally associated with the queen anne and georgian periods and is now generally applied to all case furniture. Term used to refer to porcelain cups, saucers and plates manufactured for display rather than for practical use. Examples include early soft paste porcelain items made by chelsea in the 1700’s that are not resistant to hot water but that display to a very high standard. Term used to describe the faint banding of colour shades usually found in vegetable. A curvaceous design seen mostly in furniture legs and based upon the shape of a wild goats hind leg. Usually a shallow ‘S’ curve with a broad lip and knee tapering to a slim concave leg below. Very popular possibly the cause of the mid-18thC period being known as the cabriole leg period. English and french cabriole legs have similar shapes but the french shape is usually much finer. The term used to refer to an ornamental container used to hold a pot containing a growing plant. Derived from the french cacher, ‘to hide’. A 19thC gold or silver box to hold cachous – pills for sweetening the breath. The boxes, which were made in Britain, are very small-1-2 in (25-50 mm) in length-with a hinged lid, and sometimes a ring attached for hanging from a chatelaine. The boxes are usually decorated with chasing or enamelling. Popular until c1910 and now highly collectable. A peach-shaped teapot without a removable cover and which is held upside down to be filled at the base. An internal tube leading up from the base ensures the contents do not spill when it is upright. Inspired by a Chinese wine pot, brought to Britain by the Hon Mrs Cadogan. First examples produced at rockingham in the late 19thC. then meissen, copeland, davenport and other Staffordshire potteries produced similar wares. A London based silversmith best known for his candlesticks and snuffer trays. Succeeded by his brother William, who continued the production of candlesticks until 1772. A cast or blown, thick-walled glass blank carved in relief and then undercut, leaving decoration in the form of a net or cage still attached to the main body of the vessel. Also — a form of cup known as a diatreta, and taking its name from the diatretarii, the original Roman glass decorators. The term used for a decorative, pierced or chased silver mount that encloses an inner, plain section of an object. The cagework technique probably originated in Germany, was used in Britain extensively on late 17thC tankards, beakers and twin-handled cups. Also — A cagework box is a snuffbox comprised of plaques of various materials, such as agate or ivory, set in a pierced metal frame. The term for porcelain decoration of a lacy network of oval and circle outlines, usually painted in gold. French for pebbled. Introduced by sevres in the mid-18thC, usually set against a rich dark blue background, and also seen on worcester, derby and swansea wares. A creamy-white art glass developed by Frederick carder c1915 in the USA. Its translucency, achieved by adding bone ash to the molten glass. Particularly suitable for lampshades. Also used in conjunction with aurene glass, to make cameo glass. A clock with separate indications on the main dial, or with extra dials, for the phases of the moon, the day, month and the year. It is rare to find a year dial. Calendar information appeared on public clocks from the 14thC, and on domestic clocks from the 16thC. The diameter of a gun barrel. The inner surface is the bore. in the south-west of India, during the 17th and 18th centuries and later manufactured in Britain. Used, with painted or printed patterns, for soft furnishings and poular during the 18th and 19th centuries. The first negative-positive photography technique, pioneered in 1841 by British scientist William Henry Fox Talbot (1800-1877). The process allowed an infinite number of prints on paper to be made from a single paper negative. The calotype eventually superseded the daguerrotype. A gemstone or shell cut to reveal a design in relief. Cameos were originally made from gemstones with different coloured layers to provide a contrasting background. Widespread in the roman era and during the italian renaissance and neoclassical periods. Shell cameos were carved with classical portraits and mythological scenes in Naples and Rome during the 19thC then exported to britain to be used as seals and jewellery. Cameo glass is a multi-layered glass on which a picture or portrait has been carved through the layers so that it stands out in relief from the surface, and the coloured layers form contrasts to the image. The simplest form of cameo glass has only two layers. Also — cased glass and sulphides. The word cameo actually applies to any carving in which the picture is raised above the surrounding surface; but in the glass world, it is only used for carving where there is more than one coloured layer to the glass. The surrounding glass may be cut away using hand tools, the oldest and most skilful method; or by using a cutting wheel, or with hydrofluoric acid which eats away the top layer. Roman cameo glass made two thousand years ago by artisans using hand tools. The famous Portland Vase is an example. English cameo from the mid 19th century by artists such as John Northwood and George Woodall (their copy of the Portland Vase is a superb example). French cameo glass made from the late 19th century until the second world war by artists such as Emile Galle, the Daums, and Muller Freres. There was also a small amount of cameo glass made by other manufacturers, including Steuben and Tiffany in the USA. Also — Peking cameo glass from China predates the European production and was produced from the 18th century. A dark box with a small opening or lens through which the image of an object is projected and focused onto a facing surface. The device was used by 17th to 19thC artists to produce accurate paintings and drawings. 18th and 19thC portable furniture, including washstands, writing chests, chests of drawers, beds and chairs, for military use. Usually of mahogany or teak, with brass fittings and removable feet. Chests would be made in halves and other pieces could unscrew in order that they could be stacked flat for travelling. An inverted bell-shape vessel or vase seen in ceramics and metalware since classical times. Popular in the early 19thC. The french term for a settee used in the late 17thC. Normally upholstered with some of the wooden structure, such as the top rail or apron, left exposed. The means of marking ceramic products that are sub-standard seconds or part of a discontinued range, by painting or scratching one or two strokes over the original factory mark. Meissen, had a range of cancellation marks to denote whether a piece was to be sold in-the-white, unglazed, or rejected. The branched form of a candlestick. 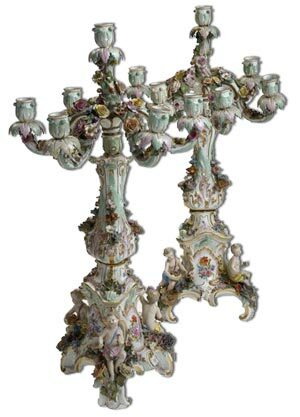 Normally made as a pair, (candelabra), and used in britain and europe since the middle ages. The small wooden support for a candlestick, occasionally found on 18thC desks, tables and bureau cabinets, which slides into a built-in recess when not in use. Utensil for holding a single candle, used in Europe from the 10thC or earlier.. The woven fibrous strips from the stems of a group of palms known as rattans, which are used in furniture. Canework came to Europe from China via the Dutch East India Company trade in the 17thC. It was popular in Europe in the second half of the 17th, and again from the end of the 18thC. The Chinese wove the outer fibres of the trees into very fine-meshed, silk-like, opaque panels. The Europeans used wider strips of cane, resulting in a light, straw-coloured, open mesh, usually with octagonal holes. Cane is a reasonably cheap material, strong yet light in weight and elastic. In the 19thC the coarser strips of the rattan palms were used in the production of basketwork furniture. Also — A stick of glass, sometimes multicoloured, made by arranging coloured lengths or rods of glass in a bundle, melting then marvering (rolling) them in clear glass to form a cane. The cane is then reheated and drawn out until it is ½ in (3-13 mm) in diameter. When cool, the cane can be sliced into thin crosswise sections to form the millefiore effect commonly seen in paperweights and mosaic glass. Canes can also be combined with twists in drinking-glass stems. Cream to light brown fine stoneware developed by Josiah Wedgwood from the 1770s, sometimes decorated with bright blue, green and red enamel colours. Caneware vessels were moulded to simulate lengths of bamboo lashed together. An obliquely angled, chamfered or bevelled edge. Set of domestic tableware or cutlery in a fitted wooden case with a hinged lid and often with two or three drawers. There are usually 6 to 12 place settings. The first canteens were portable cases carrying the eating implements of 17thC travellers and military officers. A music canterbury, originally designed in the late 18thC, is a wooden stand divided by rails into sections for storing sheet music. Some examples have a drawer or drawers fitted underneath the top rails. A chair made using the cantilever principle, in which the load is supported only at one end. Mart stam’s 1920s tubular-steel prototype combined strength and lightness, but its shape was so new -the seat appeared to be floating in midair – that the public were afraid to sit on it. More commercially successful examples were produced a few years later by designers Ludwig mies van der rohe and Marcel breuer..
Chinese export porcelain decorated in Canton (Guangzhou). In Europe, Canton generally applies to 19thC Chinese porcelain decorated with panels of flowers and scenes with figures on a gilt and green scrolled ground. Also – Canton’s enamelling workshops produced enamel-painted copper known as Canton enamel. The Chinese acquired enamelling techniques from Europe in the 18thC and developed their own distinctive products, almost entirely for export, decorated particularly in famille- rose and famille-verte colours. A Unit for measuring the weight of gemstones, including diamonds and pearls. It was standardised in 1914 as one-fifth of a gram (200 mg), equivalent to 3.086 grains. Also – Measure of the fineness of gold, based on 24 units. A 22 carat gold piece is an alloy of 22 parts pure gold and 2 parts another metal, such as silver. A firearm similar to a musket or rifle but usually with a shorter barrel and firing range and commonly carried by cavalry. Large bottle used for storing liquids such as acids or for display purposes in pharmacies. The body of the vessel is often bulbous with a long, narrow neck and matching stopper. Carboys were usually made of clear glass in order to show the colour of the liquid inside. The main body of a piece of case furniture, before doors, drawers or shelves are added, and onto which veneers are laid. A table which has four hinged triangular pieces that open out to form a square, lined playing surface, often decorated with marquetry. British glass designer who (1880-1903) worked for stevens & williams. He moved to the USA, where he co-founded the steuben glassworks. Here, inspired by the art nouveau movement, he experimented with coloured glass, various finishes and the lost-wax process. A key figure in 20thC British art pottery, who trained with Bernard leach at St Ives in the 1920s. He left to start his own pottery at Winchcombe, Gloucestershire, where he made everyday items such as bowls and cider jugs, in slip-decorated, lead-glazed earthenware. Unlike Leach, his work followed English rather than Japanese pottery traditions. A period in West Africa from 1942 marked a change to stoneware, African motifs and deep blue and green glazes highlighted by orange-brown brushwork decoration. A series of bells rung either mechanically or manually. Mechanical carillons have been used in domestic and public clocks since the 14thC to strike the hours or play leys in musical clocks. A writing table with a low superstructure and drawers at the back and sides of the writing space. The name derives from the original design made for the Prince of Wales’s bedroom at his London residence, Carlton House. Earthenware and porcelain produced from c. 1890 at Carlton Works, Staffordshire, which traded as Wiltshaw & Robinson. The pottery is known in particular for producing art deco ornamental ware such as porcelain vases with enamelled and gilded decoration and lustre wall masks, vases and plaques painted in delicate pastel shades. The pottery also produced crested ware, coffee sets and cruets. Ivory leaves in a decorative case on which the names dancing partners were inscribed in pencil in the 18th and 19th centuries. Tablettes are similar, but the leaves can be removed from the case. Style of furniture made during the reign of the British king Charles I (1625-49). The term is sometimes misleadingly used for Restoration style, dating from Charles II’s restoration to the throne in 1660. The first truly portable type of clock produced in large numbers, developed from coach watches and small portable table clocks. They have a spring-balance escapement, a glazed rectangular brass case, and a carrying handle. Heights range from 3 in (76 mm) to 8½ in (21 cm). 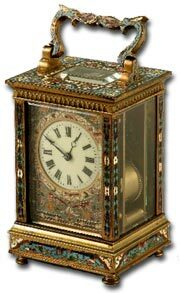 Carriage clocks were introduced by French clock-maker Abraham-Louis breguet c1796. Over 90 per cent of them were produced in France, particularly during the height of their fashion, 1850-1914.
traditional costume. The style was at its height in the 17thC. Portrait photograph, usually full length, but occasionally head and shoulders, mounted on a small card with the photographer’s credit on the reverse. The idea was patented by French photographer Adolphe-Eugène Disdéri in 1854. He used a special camera containing a number of lenses; several poses could be achieved on a single negative. Cartes-de-visite were mass-produced during the mid- 19thC. Spring-driven wall clock set in an ornate, Rococo or neo-classical style frame or case. Produced in France, Germany, Austria and Italy c1735-1900. Giltwood versions were also made in Britain. c1750-1800, often with a false pendulum in the dial. French jewellery firm founded in Paris in 1847. Cartier at first specialised in enamelled gold set with gemstones, but is perhaps best known for its art deco jewellery and watches. Cartier introduced the first wristwatch in 1904 of the round-cornered square design still seen today. A piece of furniture fitted with compartments to hold papers, either freestanding with a cupboard below and clock on top, or an accessory for placing on a desk. The full-scale, preparatory design – either drawn or painted – for a tapestry, painting or mosaic. A small sketch, which is enlarged to make a cartoon, is known as a petit patron. A decorative detail or object suggestive of a sheet of paper with scrolled edges. In ceramics or silverware, it may take the form of an oval or shield with a decorative feature or inscription, and a scrolled frame, and in furniture a tablet shape with curled edges. Cartouche borders are seen on old maps and prints. An elbow chair – a chair with arms as part of a set of armless or single dining chairs. The skill of the woodcarver in furniture-making, as opposed to that of the carpenter, cabinet-maker or joiner. The craft gained greater status from the late 17thC until the later part of the 18thC; it became highly specialised particularly for cabinet stands, candelabra, mirror frames and console tables, which might then be gilded. Sculptured female forms, taken from Classical Greek style, widely used as ornamental supports on furniture and chimneypieces from the late 16thC onwards. The 19thC male equivalents are known as atlantes. Term for pieces of furniture which are intended to contain something – cupboards, cabinets, chests, bookcases and clothes presses, for example. Glassware consisting of two or more layers in different colours. casing is blown first into a cup shape. A second layer is blown into it and the two are then reheated so that they fuse together. The process is repeated if further casings are required. The outer layer can then be engraved or cut to reveal the contrasting layer beneath. See cameo glass. Glass or ceramic vase usually one of a pair, with a reversible lid. The inverted lid serving as a candle holder. Impure form of iron which has been cast and moulded. It has been used since the Middle Ages, but most extensively from the 18thC particularly in the Victorian era. Cast iron is brittle, but cheaper than wrought iron. Italian antique dealer, goldsmith and jeweller based in Rome. From the early 1865 he imitated Etruscan and Roman jewellery and reproduced the ancient technique of making granulated gold. He also produced jewellery with filigree decoration and miniature mosaic work. His sons carried on the family business and their work became popular in Britain, where it has been frequently copied. The Castellani mark is a monogram of interlaced Cs. Fine white stoneware with a slight translucency, made at Castleford near Leeds c. 1800-20. It has a smooth texture similar to that of parian ware with low relief decoration. The most common articles made were jugs and teapots, often with distinctive blue enamel trimmings. General term for several varieties of gemstones which when viewed in a certain direction and light display a streak, likened to a cat’s eye. The effect is a result of a fibrous inclusion, such as asbestos, naturally occurring within the gem, and is enhanced by a smooth cabochon cut (see jewel cutting) . Small, covered, one or two-handled cup with a saucer used for caudle, a spiced gruel of eggs, bread or oatmeal, and wine or ale. Usually intended for invalids or nursing mothers, the cups were made of silver or pottery, principally in the late 18th and early 18th centuries. Shropshire pottery probably founded c.1750, and best known for its soft-paste porcelain, called Salopian ware, produced from 1772. Caughley was noted for the excellence of its potting techniques rather than for the originality of its design. It openly imitated the shapes and designs of articles produced at WORCESTER, 40 miles (64 km) away, sometimes even reproducing Worcester’s crescent mark. In the late 1780S and 90s, much of. Caughley’s output was decorated in bright enamels with some impressive gilding by the Worcester outside decorator Robert CHAMBERLAIN. Dainty, CHANTILLY-style floral decoration is typical,together with Oriental-style blue and white tableware.The pottery closed c. 1812, business being transferred to coalport. creamware pottery introduced by Josiah wedgwood and Thomas whieldon in the 1750s. Teaware, lidded bowls, tureens and punch pots were made in the form of a cauliflower. The idea later extended to melons, pineapples and maize and was copied at other potteries and in porcelain at chelsea and worcester. Reproductions were made during the mid- 19thC but are of inferior quality in modelling, glazing and colours. Light reddish-brown aromatic timber from North America and the West Indies. Because of its aroma and insect-repellent qualities it was often used from the 19thC by cabinet-makers for the linings of drawers, boxes and chests, and for trays in clothes presses. A European term for Chinese stoneware, initially developed during the song dynasty, with a translucent green glaze, and generally applied to any similar green-glaze. The shade varies according to the iron-oxide content. The word ‘celadon’ possibly comes from a character of that name in a 17thC French romance by Honoré d’Urfé, who wore a green coat. An all-embracing term introduced in the 18thC, for wine coolers and wine cisterns. It is also used for trays or compartments fitted into a drawer or sideboard, for holding bottles of wine and spirits. Heavy, ornate jug, moulded with masks, strap work and caryatids. The style is typical of that employed by the Renaissance goldsmith and sculptor Benvenuto Cellini. Vessel of silver or other metal, used for heating food and warming plates over a charcoal brazier or spirit lamp on the dinner table or sideboard. The dish rests on a stand supported by legs, which afford space for a heating device. Chafing dishes were used extensively from the i6thC. The term is sometimes used to refer to the brazier itself. French term for an upholstered or cushioned chair with a whole or part back, and a long seat. Neo-classical architect and furniture designer, and, with Robert Adam, joint architect to King George III. Chambers was the first British architect to visit China, and as a consequence his chinoiserie work had a more authentic feel to it than much of that popular in the mid-18thC. Holder for a single candle with the sconce set into a saucer with a carrying handle attached, designed for bedroom use. Chambersticks were made from the 17thC and often had a snuffer attached. Edge that is planed or cut at an angle, usually applied to stone and woodwork. It is uncertain whether special glasses were reserved for drinking champagne during the 17th and early 18th centuries. From the 1770s until the mid-19thC, flute glasses were favoured – a trend that has returned today, because the narrow mouth retains the bubbles for longer. From c.1830, a wide shallow bowl of 4-6 fl oz (115-175 ml) capacity was popular. A soft-paste porcelain factory on the Prince de Condé’s estate near Paris, c. 1725-89. Early Chantilly porcelain has a distinctive white tin glaze and often KAKIEMON-style decoration. After 1740, a lead glaze was used and decoration was mainly naturalistic, featuring birds and flowers, including the Chantilly sprig – a cornflower with two leaves, and two sprays of forget me-not flowers. The Chantilly lacemaking industry began in the late 17thC. It is particularly famed for its delicate handmade bobbin lace of the 19thC. This is usually a black silk lace with the pattern outlined in a thicker strand of silk. Ring on the dial of a clock marked with the time divisions. Flat-bottomed pot used from the 17th to 19th centuries for serving potted char, a relative of the trout, and often decorated on the outside with painted fish. The pots are about 25mm deep and 15-25cm across, and found in delftware and creamware. Large circular or oval plate used for serving meat or for hanging as a wall decoration. The word is probably derived from the French charger, ‘to fill’. Any method of decorating silver and other metalware in which the metal is repositioned, rather than removed by chiselling or carving. embossing and repousse are both forms of chasing. Bold, high-relief patterns are embossed; finer detail is added by the repoussé technique. Flat-chasing is also worked from the front using hammers and punches, resulting in very shallow, low-relief patterns similar in effect to engraving. London silversmith who worked with his brother, William, and was known as a spoon-maker. He was the son of a silversmith, Thomas Chawner, and in 1796 established a partnership with the emes family, producing fine-quality silverware. A soft, tufted cord of silk, cotton or woollen yarn used in embroidery or for fringing fabrics. Also – Any fabric made of chenille cord and, more generally, any of various imitation velvets produced from the 19thC. These include chenille axminster carpets, which are large velvet-like carpets made using a two-loom weaving process at the axminster carpet factory. The most popular fruitwood for furniture-making as it is hard and even-textured, with a superficial resemblance to mahogany, and polishes to a good finish. The cut wood of the British species varies in colour from pinkish-yellow to red-brown. Cherry was used particularly on the turned members of country-made chairs and tables in the 17th and 18th centuries, and by artist-craftsmen at the end of the 19th and in the early 20th century. Victorian design of well-padded, over-stuffed sofa, often buttoned, and with back and arms of the same height. Horse chestnut is a native European species which produces a pale yellowish wood sometimes with a hint of pink. It has a close, even grain and has been used over the centuries for drawer linings, turned work, carving and inlaid decoration, but it lacks durability. Sweet chestnut is light reddish-brown, sometimes used as a substitute for oak in panelling, but rarely seen in case furniture. Small 18thC English writing desk, with slender, tapering legs and a set of small drawers and pigeonholes on top. It is sometimes known as a lady’s cabinet. Decorative motif, seen in the 18th and 19th centuries, which originated in Classical mythology. It combines the features of a winged goat or lion with a serpent’s tail. A glass-fronted display cabinet for porcelain or cabinet-ware, introduced in the late 17thC when it was fashionable to collect chinese export porcelain. A white clay virtually free of impurities such as iron, also known as kaolin. It is used in ceramics for its qualities of strength and whiteness, and is an essential ingredient of porcelain. The Chinese refer to the porcelain formula metaphorically as ‘bones and flesh’, china stone being the bone, china clay the flesh. Chinese porcelain products imported into Europe from the 16thC, and reaching a peak in the 17th and 18th centuries. Technically superior to European ceramics until the 18thC, Chinese porcelain was in great demand, and had a profound influence on European manufacturers who tried to capture its quality and decorative effects. The holds of East India trading vessels, especially from Holland and Britain, might be filled with flint for use in Chinese porcelain manufacture on the outward journey, and with china on the way back. The china was stacked beneath the principal cargoes of tea and silk (which had to be stored above the waterline), providing valuable ballast on the return journey. Most of the wares were of fairly ordinary quality, but there was a thriving private ‘super cargo’ trade in higher quality porcelain often specially commissioned by the Western aristocracy. Japanese lacquer technique, which originated in China. Stylised geometrical or floral diaper (see decorative motifs) patterns are engraved into a lacquer base and then filled with gold powder, foil, or coloured lacquers. 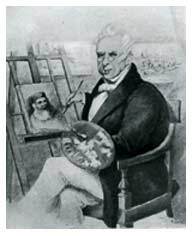 George Chinnery was born in London in 1774. After training in England, he moved to Dublin where he became famous for his portraits and miniatures. He left for India in 1802 when he ran into debt, and he settled there for the next twenty-three years. In 1825 Chinnery set foot in Macao, China. where he spent the next 27 years. His frenzied sketching of the streets and alleyways of Macao became legendary. Chinnery’s prolific and brisk sketches of street scenes have been much proclaimed and praised. He mentored Lam Qua, who eventually became a renowned medical portrait painter. He travelled around the Pearl River Delta, between Macao and Canton (now Guangzhou) and was considered the most influential nineteenth century Western artist in the East. The period between Chinnery’s departure to the Orient and his death in Macao, coincided not only with the golden era of British Landscape Painting but also with times of great prosperity for Macao which saw its port transformed into one of the greatest trading stations of Asia. After a visit to Hong Kong when the British seized the city, he fell ill and died in Macao in 1852. George chinnery lies buried in Macao’s Protestant Cemetery. A 17th and 18th century chinese style of ornamentation. The style used pagoda shapes, fretwork, mandarin figure motifs, as well as birds and river scenes, dragon finials and carved feet. The decoration was applied to lacquered furniture c1690, and engraved on silverware and painted on ceramics, especially on dutch delftware. It became very popular during the mid-18thC rococo period. Cotton furnishing fabric in plain dyes or with printed patterns, and from the 1850s with a highly glazed finish. The word is from the Hindu chint (variegated) and at first applied to painted or printed calicoes imported from India in the 17thC. Medieval and 16thC wood decoration made by chipping out a pattern with a gouge or chisel. The pattern is usually contained within a circle, or roundel. Covered vessel for preparing and serving hot chocolate, used since the second half of the 17thC. The silver chocolate pot has a hinged or detachable flap or finial in the lid though which a molinet, or rod, can be inserted to stir up the chocolate sediment. Molinets are usually made of wood with a knop or terminal in silver or ivory. A ceramic chocolate pot may be indistinguishable from a coffeepot. An optical toy introduced in 1866 consisting of a lantern with a window and shutter. Various different images in glass slides (see magic lantern) are passed across the window. Each image is viewed for a fraction of a second before the shutter falls and the next image is projected, giving the illusion of movement. Miniature jug used for individual servings of alcohol, dating from British colonial India at the end of the 19thC. Chota is the Hindi word for ‘small measure’. Founder of L’Orfèvrerie Christofle, a large firm of goldsmiths, silversmiths and jewellers, established in Paris, 1829. In 1842, Christofle obtained the sole rights to produce electroplated wares in France from the British silversmiths, elkington. The firm also produced furniture and bronze furniture mounts. Chemical, colour-fast dyes for carpets and other fabrics, introduced in the early 20thC. Although they lack the subtlety and variety of natural vegetable and insect dyes, it can be difficult to distinguish between them. A very bright and hard, silvery metal used in the production of stainless steel and as a decorative, corrosion-resistant plating material. Although discovered in 1798, its decorative potential was not realised until it began to be commercially available in 1925. modern movement designers such as le corbusier and breuer used chromium plate on the tubular-steel furniture that had such an impact on 1930s design. A portable timepiece of great accuracy. In Britain the term is used specifically for one with a detent escapement, and in Switzerland for one with a lever escapement, which meets an official rating of timekeeping. Chronometers were originally developed in the 18thC for use at sea so that a ship’s longitudinal position could be calculated accurately. Unlike pendulum-driven clocks, which are accurate only if stationary, chronometers aimed to be reliable even when subjected to temperature changes and the movement of a ship. The standard Greenwich mean time on the chronometer was compared with the ship’s local time gauged by the position of the sun or the stars. Mapping survey chronometers are set in a box; marine chronometers are usually in a drum-shaped case pivoted in gimbals (two rings at right angles to each other) in a wooden box with a glass lid. Pocket chronometers were used both at sea and as pocket watches on land. All chronometers have a seconds hand; some show fractions of seconds. Most surviving examples are from the 19th and early 20th centuries. The term for Ancient Greek wooden statues overlaid with gold and ivory, which in the 20thC refers to cast-bronze figures with ivory flesh parts, popular 1910-30. Florentine engraver, painter and draughtsman, and founder-member of the Royal Academy of Arts in London (1768). Cipriani moved to Britain in 1753, and his greatest contribution to late 18thC neoclassical style lay in his paintings of nymphs and figures, some on satinwood furniture. An early 17thC surveying instrument with a central compass surrounded by a brass circle marked with degrees, over which arch several sights to guide the eye. From 1758, English surveyors used it with a theodolite allowing them to measure both horizontal bearings and elevation at one time. French for ‘waxed’, referring to a hard, glossy finish given to fabrics, especially ribbons. Barometer containing a straight glass tube, closed at the top end and with the bottom end immersed in a small chamber, or cistern, containing the mercury. The cistern cover is often decorated with bronze mounts and wooden carvings. See siphon barometer. A variety of quartz, usually pale yellow although occasionally red-brown to red-orange. The main source of citrine is Brazil. It is often confused with yellow topaz. French for ‘moonlight’, used to describe a porcelain glaze of milky lavender-blue. The effect was achieved by adding a touch of cobalt blue to a feldspathic glaze, and is most commonly seen on 18thC Chinese porcelain, sometimes combined with a crackle of black or brownish-red. It was also used at meissen without the crackle effect. 19thC wine jug, generally with a glass body held in decorative silver or silver-gilt mounts. A claret jug usually has a hinged lid with a thumbpiece which is often decorated with a figure. Strictly, a two-handed Scottish sword introduced in the 16thC; the word is from the Gaelic claidheam-mor (great sword). Since the 18thC the term has also referred to a Scottish sword with a basket hilt. Firm of glass-makers founded c1837. It specialised in millefiori, producing fine and highly collectable paperweights, inkstands, vases and other domestic objects. Clichy aperweights can sell for £10,000. Staffordshire pottery decorator famed for her distinctive, brightly coloured designs for A.J. wilkinson at its Newport Pottery. Cliff set up her own studio at Newport in 1927 and launched the hand-painted ‘Bizarre’ range the following year. She occasionally used designs by contemporary artists such as Paul Nash and Laura Knight on her pottery. By the end of her career, Cliff had produced around 2000 patterns and 500 new shapes. The illegal practice of shearing metal from the edge of a precious-metal coin for profit – a universal practice dating from ancient times. Clipping was relatively easy to do with hammered coins, although it could be detected with careful and consistent weighing. The penalties were severe for those who were caught; sentences of death or limb amputation have been recorded. Clipping was largely stopped with the introduction of machine-made coins in Britain from 1662. The technique of overpainting an already existing design on ceramics. The Dutch, in particular, used clobbering to embellish Chinese blue and white export and meissen porcelain during the 18th and 19th centuries. Pointers on the dial of a clock which indicate the time. They are found in brass, silver and other metals, sometimes decorated with enamel. Early clocks have single hour hands in sturdy, arrowhead or spear shapes. The first pendulum clocks of the mid- 17thC have hand-fretted, filed and chased hands; at this time, too, minute hands became a standard feature. As the size of longcase clocks increased at the beginning of the 18thC, the hands became bigger and bolder. From c.1790, clock hands were stamped out by machine to create ornate scrolls and curves, 19th and 20thC clock hands are much plainer and the minute hand is closer in size to that of the hour hand. Any watch which strikes the hour and sometimes quarter hours automatically as the hands go round. Helmet protecting head and neck dating from the 15thC. Lidded stool which conceals a pewter or earthenware chamber pot or similar vessel beneath the seat. The alternative terms of night and necessary stools were replaced in the 19thC by what the Victorians called a night commode. The method of coating iron or other base metals with a film of silver that preceded sheffield plate. It was used from early times – for plating knife handles, for example -and in the 18thC for small objects such as buttons and buckles. The objects were dipped in molten tin; silver foil was pressed over the surface, and the metals fused with a hot soldering iron. Antique Art Glass developed by J. Couper & Sons of Glasgow c. 1885, and mostly designed by Christopher Dresser. Its name is thought to come from the Gaelic word for the River Clyde. It is usually green, yellow or amber (occasionally turquoise or black), with numerous air bubbles, irregular cloudy streaks and flecks of AVENTURINE. Cloudy, bubbly art glass developed in the USA by the British designer Frederick Carder. The effect was created by adding saltpetre (potassium nitrate) to the molten glass; the chemical reacts with the heat to form the large, random bubbles. Cluthra glass is cased with an outer layer of heavy, clear glass. Large, portable timepiece in the form of a 4-6 in (10-15 cm) diameter pocket watch. Such watches, often with an elaborately decorated case, were used in coaches during the 18thC. Many have hour or hour and quarter-hour striking mechanisms. Clay-based artificial stone invented by Mrs Eleanor Coade at her London factory c. 1769. It resembles natural limestone, but is more durable. Coade stone was much used for garden statuary until the mid-19thC. Shropshire iron foundry established 1708, which produced decorative and utilitarian cast iron ranging from ornamental vases to stoves and seats – see Coalport Porcelain and Coalport Marks. Porcelain factory established on the banks of the River Severn in Shropshire, 1795, which absorbed the nearby caughley factory four years later. A form of bone china was produced at Coalport from 1798 but only achieved the soft white translucency and smooth surface for which the ware is now celebrated after 1810. A hard, clear, and highly lustrous lead glaze, introduced 1820, further improved quality and enhanced the bright enamel colours used. A maroon ground, introduced the following year, became one of Coalport’s trademarks. Until this time, output had concentrated on simply decorated tableware, although there were Oriental-style designs too, including the willow pattern, and the much imitated Indian tree pattern which was first used at Coalport. From the 1820s, however, decoration became more opulent and lavishly gilded. The next decade saw an increase in range and even more elaborate designs. Masses of finely modelled, flower-encrusted vases, candlesticks, baskets, clock cases and jugs were made up to 1840. Up to 1815, pieces were marked (if at all) ‘Coalbrookdale’, ‘CD’ or ‘C. Dale’ after the neighbouring town. Ornamental vases made in the 1890s often incorporate small landscape panels (signed by the artist) within jewelled line borders. These cabinet pieces competed strongly against worcester and derby porcelain of the same period. See: Coalport Porcelain and Coalport Marks. Circular stand, usually of silver, sheffield plate and/or wood, within a raised rim or gallery, for port or other wine bottles or glasses. Coasters were used in Britain from the 1760s. The name is derived from the after-dinner custom of rolling back the tablecloth and coasting, or sliding, the port from person to person on a smooth-bottomed stand. Double coasters on wheels are known as wine trolleys. Prominent wooden bead moulding commonly used to edge British walnut and mahogany drawer-fronts, c.1730-1800. Cylindrical porcelain coffee cup, about 2½ in (60 mm) wide and high. Larger versions are called breakfast cans. 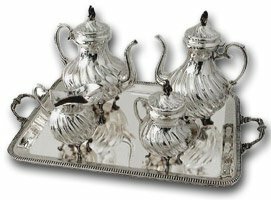 Covered vessel, generally of silver or ceramic, for serving coffee, used in Britain since the mid- 17thC, when coffee was first imported. The spout is normally directly opposite the handle, although sometimes at right angles to it, and is higher on the body than would be the case on a teapot, to avoid the coffee sediment escaping. Drinking glass or jug with one or more coins enclosed in the knop or foot. Although examples exist from the early 18thC, the date on the coin rarely signifies the year the glass itself was manufactured. Such pieces were made to commemorate special occasions like a coronation. Decoration, also known as cold pigments, on ceramics painted in oil or lacquer-based colours that, unlike enamels, are not fused onto the surface by firing. Even when coated with varnish, the colours are prone to flaking and wear. Cold pigments were used on some Meissen red stoneware and Berlin faience, but few examples survive. British designer of ceramics and household objects, who designed an award-winning tea service for minton, 1846, under the pseudonym Felix Summerly. His firm, Summerly’s Art Manufacturers, operated 1847-50 designing household wares, with an emphasis on good industrial design. Cole also assisted in the organisation of the Great Exhibition, held in London in 1851. Ring applied to the stem of a wine glass to disguise a join, used when a glass was made in separate pieces and fused together. It is frequently seen where a bowl or foot joins a stem, but may also be seen around large knops. Vertical support, circular in cross-section. In their pioneering orders of architecture (see box opposite), the ancient Greeks introduced three distinct styles -Doric, Ionic and Corinthian – and the Romans later added the Tuscan and Composite orders. All of these orders are seen reproduced in furniture, furnishings and decorative objects. See also pediment. A decorative effect on ceramics achieved by scratching or incising the clay while still moist with a comb-like instrument. The incised areas are flooded with a translucent glaze. This technique is seen particularly on Chinese celadon wares of the northern song dynasty. Also – Pattern on ceramics achieved by coating the body with a liquid clay slip and creating either wavy or zigzagged lines or a feathered effect with a metal brush or comb. The technique was developed by John dwight, John astbury and Thomas whieldon, and is commonly found on 17th and 18thC Staffordshire slipware. Objects inscribed or decorated to commemorate an event or a person. In the late 17th and early 18th centuries, the French name for a low chest of drawers. The word gradually came to describe any low cupboard or chest which was of a decorative French pattern. Freely rotating circular card in a navigational or surveying compass that is marked with the points of the compass. It has a compass needle mounted beneath so that it swings to point to magnetic north. This is a shallow, ornate box for holding writing materials when travelling, which opens out to provide a writing surface. Also – A multifuctional or combination scientific or navigational instrument, such as a portable sundial combined with a wind vane. A watchmaker’s term for pocket watches that not only tell the time, but incorporate extra features such as automatically changing calendars, stopwatch or repeater mechanisms. Ornamental glass or ceramic stand dating from the 18thC, with a shallow dished top and sturdy stem. They are 5-18 in (12.5-46 cm) tall, and were designed to hold sweetmeats, fruit, cakes or bread. See tazza. Plaster-like material made from whiting (chalk), resin and size or glue, and used to make relief mouldings on furniture. Compo can be pressed into moulds when wet, and is hard enough to be carved when dry. It was widely used in Britain in the second half of the 18thC. A version of compo based on wood-pulp materials mixed with ingredients such as eggs, crushed bones or bread was used for dolls’ bodies c. 1820-1940. Carton is a cheap form of this used for dolls’ bodies in the 1920s and 30s. Founder of a London silversmiths which produces hand-made dressing-table services, photograph frames and other items from 1848. The folding frame of a type of card table popular in the mid-18thC. The hinged sides straighten as the back legs are pulled out, and fold back concertina fashion. Double or triple-seated chair set in a curving S-shaped framework, designed so that two or more people can converse more easily than if they were sitting side by side. A mechanical version with swivelling seats is known as a sociable seat. Confidantes were popular in Victorian and Edwardian times. Type of side table supported by one or more legs at the front, and fixed to the wall with brackets at the back. The first producer of true porcelain in Britain. The discovery of china clay and china rock deposits in Cornwall led to Cookworthy’s successful formula in 1768 at his plymouth factory. Cookworthy was probably also involved in the development of soft-paste porcelain incorporating soapstone used at bristol and worcester. British pottery designer and painter. She studied at the Burslem School of Art in Staffordshire and set up her own company in 1929. Her designs are Modernist but appealed to a wide but fashion-conscious market. In 1966 Cooper became senior designer at the wedgwood factory. Porcelain figures were produced from c. 1780. The company declined in the early 19thC but revived when it was taken over by the Alumina Faience Manufactory in 1882. Architect Arnold Krog, appointed artistic director in 1885, introduced a revolutionary new glazing technique which washed the whole of a piece of porcelain with colour as opposed to the previous style of painting small areas, and the earlier formal style of figure-modelling was replaced by more naturalistic forms. German studio potter who settled in Britain in 1939 and shared a studio with fellow potter Lucie rie. Coper identified strongly with the Modern movement, producing roughly textured sculptural pieces. Engraver and designer of the early Georgian period. Copland was an early exponent of the Rococo style in England as seen in A New Book of Ornaments, a much-copied pattern book he compiled with Matthias lock, published 1752. He and Lock worked together on several other publications, including Thomas Chippendale’s The Gentleman and Cabinet Makers Director. Shell ornamentation found in rococo designs. A hard, organic substance, formed from the skeletons of marine polyps and used for personal adornment since Egyptian times. The variety chosen for jewellery is solid, without visible indentations, and varies in colour from pinkish-white to red. Coral jewellery became popular in Britain in the mid- 19thC when it was imported from Naples and Genoa. Trade name for a type of glass decoration developed in the USA. Coral-like forms were painted on glass in enamel and small glass beads were fused onto them. The technique was used for both figurative and natural designs, and was also popular in Britain and Europe. Shape made of clay or mud and straw around which glass was moulded. The technique, dating from 1500 bc, died out when blowing was introduced but was revived in the late 19thC for making mosaic glass. A red variety of the quartz gemstone chalcedony, which is used in jewellery, especially in signet rings and beads, and for seals. The gems range from medium, slightly cloudy red to clear, deep red. Chair introduced in the early 18thC with a single front leg, and low back and top rail. This type of chair is also known as an angle or writing chair. The decorative projection or moulding above a frieze in architecture or topping a piece of furniture such as a bookcase, cabinet or the tester of a bedstead. Major US glass factory founded 1868 and still in operation. It developed the heat-resistant glass known as Pyrex (1908). In 1918 the company acquired the steuben glassworks, renowned for its art glass, and the British designer Frederick Carder became director of the whole operation. The most prestigious sapphires, ranging in colour from clear cornflower to deep blue are the ‘Kashmir blue’ sapphires, imported to Europe from India since 1862.Corundums can be artificially produced, but under a microscope reveal curved striation and gas bubbles which do not occur in the natural stone. Articles of jewellery made from base metals, pinchbeck or silver and set with imitation gems, such as paste. Some quality examples are made for leading couturiers, such as Chanel and Christian Dior. An upholstered and cushioned seat made to fit the corner of a room, popular in Britain in the late 19thC. The term was also applied to a comfortably furnished corner. English late 19th to early 20thC furniture-designer and craftsman’s association in the Gloucestershire Cotswolds. It was set up in 1894 by Sydney and Ernest Barnsley and Ernest gimson, who were also connected with the arts and crafts movement. The designs made use of traditional methods and untreated English woods. Dutch cabinet-maker Peter Waals was one of the foremost designers. A 17thC development of the day bed with a long, upholstered seat and a back and headrest at one end. In the 18th and early 19th centuries, the term became more or less synonymous with settee. Embroidery in which a thread is laid along the fabric and then held in place by over-stitching. Small, circular container made of silver, wood or ivory, used for storing gaming counters. They date from the 17thC. Fine silver examples contain thin, silver counters; others contain ones made of iron or mother-of-pearl. A mark, also known as a counterstamp, struck onto an existing coin or the cut part of a coin some time after it was initially struck. An ancient practice, still in use today, carried out usually as an emergency measure to revalue the currency or to validate a foreign piece for use in another country. countermark of George III on a 1785 Spanish-American 8 reales piece circulated in Britain, January-June 1804. A cupboard, the forerunner of the sideboard, dating from the 16thC. It consists of two open shelves, sometimes with a small central cupboard in the upper tier. Court cupboards were popular again in the gothic revival of the early 19thC. Cream jug of silver or ceramics in the form of a cow, particularly popular in the second half of the 18thC. Chinese porcelain ground in varying intensities of blue, irregularly crossed with dark lines to create a cracked-ice effect. It was introduced in the 17thC, and little copied in Europe, apart from some rare examples in Bristol delftware and worcester porcelain. A network of fine lines on a ceramics glaze caused when the rates of contraction of body and glaze are sufficiently different to cause a tension between the two. The effect can be deliberately produced to create a matrix of hairline cracks. These are sometimes enhanced with an iron-oxide stain, a technique perfected in song dynasty wares. Over time, perhaps centuries after a piece was fired, the tension between body and glaze coupled with a change in temperature, may result in a fine network of cracks known as crazing. Crackle glass is the third most popular collectible in the world and is also known as Craquelle Glass, Ice Glass and Overshot Glass. The process was invented by the venetian glass makers of the 16th Century. The molten glass is immersed into cold water and this produces fine cracks in the glass body. It is then reheated to seal the cracks, and either molded or hand blown into the desired shape. It was popular in the late 18th and 19th centuries and is still made today. The best glass makers, emile galle, steuben, moser, loetz, stevens & williams and webb corbet have all produced crackle glass. A fine network of cracks on a ceramic body. Caused by differences in cooling temperature rates of the glaze and the caramic body. A refined, cream-coloured, lead-glazed earthenware which removed delftware from its dominant position and threatened many continental porcelain manufacturers, including meissen. Creamware was lightweight, durable and inexpensive. It represented a key British contribution to ceramics development and was exported and copied throughout Europe. The creamware paste incorporates white Devon clay and ground burnt flints, and can be fired to a slightly higher temperature and level of vitrification than ordinary earthenware. It was developed in Staffordshire potteries c1740 and was improved by josiah wedgwood who marketed it as Queen’s Ware in 1765. At first, small motifs were added as decoration, but later examples were enamelled or transfer-printed. Colour could be introduced during glazing – as in wedgwoods cauliflower ware – and powdered metallic oxides were sometimes dusted on before firing for different finishes. Small table often designed to fit into a niche, and used in church in the 19thC for placing the Sacrament vessels on. The name now also refers to late 16th and early 17thC tables with a hinged top which, when closed, have a semicircular or three-sided surface. 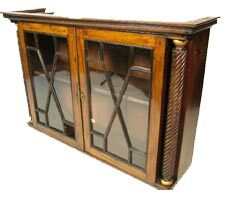 Italian word for a sideboard now often used to describe a type of low Victorian cabinet, sometimes with rounded ends and glazed or solid panel doors. A factory whose name has become synonymous with transfer-printed earthenware in France, although subsequently much was made elsewhere. Creil was founded in 1795, and became the first French pottery to produce creamware to imitate and compete with the mass of inexpensive tablewares exported from British factories such as wedgwood. Designs, transfer-printed in black, sepia or reddish-brown are of buildings, people, landscapes, hunting scenes and, in the late 19thC, of satirical subjects. Creil twice joined forces (1818-25 and 1840-95) with the nearby creamware factory at Montereau, and although Creil closed in 1895, Montereau continued using its name until 1955. Carved or moulded ornament on the top rail of a chair, or at the top of a cabinet or mirror frame. Strong, plain-weave material with a slightly ridged appearance, named after Creton, Normandy, where it was first made. It rivalled chintz as an upholstery fabric in the late 19thC and was also popular in the 1920s and 30s. Embroidery worked with a fine, loosely twisted woollen (or worsted) yarn on a canvas or linen background, popular in the late 17thC, and in early Georgian and Victorian times. Brown stoneware produced at Crich, Derbyshire, during the second half of the 18thC. Small, simple, three-legged, portable table that continued to be made into the 19thC. The tables were common in taverns as they could be used on an uneven floor. Fine network of cracks in glass caused by excess alkali in the ingredients. This problem was largely overcome by George ravenscroft in 1676 when he added lead oxide to the metal. Term used to describe furniture made during the commonwealth (1649-60). Severe and rigid forms and the lack of ornamentation reflect the Puritan austerity of the times. A Cromwellian stool is a backstool dating from Oliver Cromwell’s mid-17thC Puritan England, with straight back and seat upholstered in leather and studded with brass-headed nails. Brown, salt-glazed, 17th-18thC stoneware made at Burslem, Staffordshire, from local clays and sand. The origin of the name is unknown. It may be derived from the French cruche (pitcher), or alternatively crouch ware may have been made from crouch-clay, found near Crich in Derbyshire. It is not the same as crich ware, however. Large British coin of silver or smaller coin of gold, traditionally with a face value of 55 (25p). Crowns were first struck in 1551, and are still made from time to time as commemorative pieces. The most recent issue, for the late Queen Elizabeth the Queen Mother’s 90th birthday in 1990, was revalued by the Royal Mint at £5, although it is still confusingly called a crown. A clear optical soda glass with low light refraction. Small, stoppered bottle shaped like a decanter, originally used for holding water and wine at the altar, but subsequently used for condiments such as oil and vinegar at the table. Early examples dating from the 16thC were made of earthenware or pewter. In the 18thC glass examples became more widespread, and bottles were kept together in a frame which usually had a carrying handle. Cruet sets, as these came to be known, frequently consisted of five or more bottles or casters. Small cruet sets may consist of only two or three containers – for salt, pepper and mustard. Natural crystalline quartz also known as rock crystal, which is usually colourless and transparent. Carved crystal was highly prized during the renaissance period. In the 19th and 20th centuries it was used for cameos and seals and was also polished or faceted for jewellery. Clock with a striking mechanism that activates the appearance of a wooden cuckoo from behind trap doors. The birdcall is mimicked by two small organ pipes. Cuckoo clocks originated c. 1740 in the Black Forest in Germany, although few examples survive from before 1840. Swiss examples were not made before the late 19thC. Broken or imperfect glass which is set aside to be returned to the furnace to make a fresh batch of molten glass. It usually constitutes about a tenth of the batch. Carved decoration shaped like a bowled cup with a domed lid, found on some bulbous turned furniture legs and bedposts in the 16thand 17th centuries. Decorative feather-like figure on some woods achieved by cutting the wood at a certain angle and valued for veneers. Glass which is decorated by cutting patterns into the surface with a rotating wheel. The technique has been known since the 8thC bc, but was not practised in Britain until lead crystal was developed in the 18thC. Coins cut into pieces, officially or otherwise, to provide small change. This was a particularly common practice in parts of the British Empire in the late 18th and early 19th centuries. A short sword with a wide, flat blade, the term first appearing in the 16thC. Implements for eating and serving food. Only spoons and knives were used until 1660, when Charles II returned from exile in France with the idea of setting a table with a full set of cutlery. A lace-like form of decorating linen in which shapes are cut out of the material and filled in with geometric, buttonhole-stitched designs. It is of 15thC Italian origin and was used extensively in the 16th and 17th centuries and was revived in the 19thC. See dresden work, ayrshire work. A curved lid that rolls or slides beneath the top surface of a desk or bureau when opened. It can be rigid, or slatted as with a tambour. The style was popular in the late 18thC and again c. 1890-1910. A hard, durable, reddish, close-grained timber from southern Europe. Like cedar, it has long-lasting aromatic qualities which keep moths and insects at bay, and is resistant to worm. Cypress was considered a rare, exotic wood in medieval Europe and has been widely used for chests and boxes in Britain from the 16thC for a moulding with a partly concave and partly convex curve in profile.